Living Rivers/Clearwater Partnership traces stormwater point source pollution. Pollution from a single, identifiable source such as a property, pipe or drain – referred to as ‘point source pollution’ - poses a significant threat to waterways and public health, and can affect amenity and the longevity of drainage assets. Many organisations managing drainage assets, waterways, the public realm and urban development do not fully understand the risks, extent of the problem and what can and should be done about it. The forum discussed approaches to address point source pollution and included outstanding presentations on four industry- leading local government projects, all funded through the Living Rivers Program. The projects addressed a diverse range of point-source pollution issues and possible management actions including education and enforcement on industrial estates. The presentations were followed by discussions and a lively and informative Q&A session with an expert panel of presenters and representatives from councils, universities, EPA and Melbourne Water. Please read the presentation summary for more information. It was a fantastic opportunity to showcase the work of councils and facilitate knowledge exchange, particularly given the diverse range of council representatives amongst the 60 attendees – who included design engineers, maintenance staff, planners, local laws officers, environmental health officers, compliance and enforcement officers, and litter investigations officers. 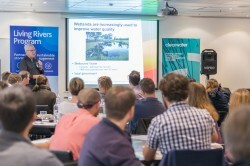 Their feedback showed an appreciation for the diverse approaches taken to achieve compliance and the opportunity to network with contacts in a variety of roles, stressing the importance of taking a collaborative approach between council, Melbourne Water and the EPA. Whittlesea case study and presentation. A big thank you to all those who helped make the event possible and finalise the case studies – Michael Godfrey, Jessica Hellier, Katia Bratieres, Tania Struzina and Jamie Comley.